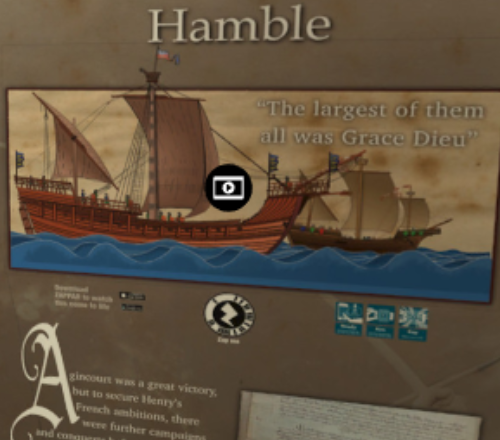 Using the latest in digital technology, Road To Agincourt – An Augmented Reality Exhibition tells the story of Henry V’s journey to the Battle of Agincourt and the impact it had on Hampshire both then and now. It features 12 pop-up panels, the content of each researched by historians from the University of Southampton and charting a different event or aspect of the now legendary battle. From Medieval ship building in Hamble to The Southampton Plot, the exhibition examines life and experiences at the time of Henry V and the legacy that remains in the region some 600 years later. Each interactive panel can be “brought to life”, with a click of a button from a smartphone. Historic images transform into thrilling animations before the viewers eyes, arrows appear to fly out of the panels and tales from another age are revealed by characters from the past, including recordings by Bafta-nominated actor Samuel West (Jonathan Strange & Mr Norrell, Van Helsing, Howard’s End and Mr Selfridge).